GOES-17 is now operational as NOAA’s GOES West satellite — the satellite will serve as NOAA’s primary geostationary satellite for detecting and monitoring Pacific storm systems, fog, wildfires, and other weather phenomena that affect the western United States, Alaska, and Hawaii. GOES-17 GeoColor view of the Northern Hemisphere, acquired on Feblruary 9, 2019. Image is courtesy of NOAA. The latest milestone for GOES-17 comes exactly 11 months after the satellite first reached its geostationary orbit 22,000 above Earth. Launched March 1, 2018, GOES-17 is NOAA’s second advanced geostationary weather satellite and the sister satellite to GOES-16 (also known as GOES East). Together, the two satellites provide high-resolution visible and infrared imagery as well as lightning observations of more than half the globe — from the west coast of Africa to New Zealand and from near the Arctic Circle to the Antarctic Circle. GOES-17 has already been helping forecasters track the weather and other environmental hazards in places such as California, Alaska and Hawaii. The satellite began transmitting its first images from its new orbital position in November of 2018. Since then, forecasters have been using GOES-17 data to see weather forming over the northeastern Pacific Ocean, where many weather systems that affect the continental U.S. first form. 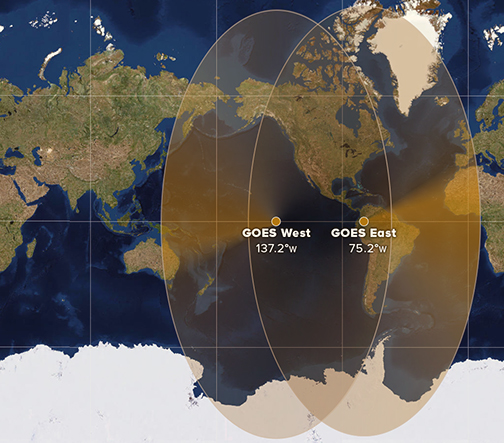 Map showing the geographical coverage of the GOES East and West satellites. Image is courtesy of NOAA. Until recently, high-quality data coverage of the Pacific Ocean was sparse. Now that GOES-17 data is available, forecasters have access to more detailed views of high-impact weather systems and other environmental hazards such as wildfire smoke and volcanic ash. 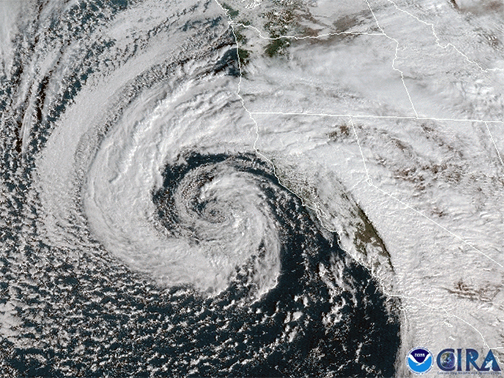 For example, GOES-17 helps forecasters predict the intensity and impact of Pacific storms that hit the West Coast. These include atmospheric river events that bring heavy rain and high-elevation snow to California and the Pacific Northwest, especially during the winter months. In Hawaii and the central Pacific Ocean, GOES-17’s high-resolution visible and infrared imagery will improve hurricane forecasts and allow meteorologists to better predict areas of intense rainfall. In 2018, Hawaii set a new national rainfall record when 49.69 inches of rain fell in 24 hours. The state also faced several tropical weather threats in what became an active hurricane season in the Central and Eastern Pacific. 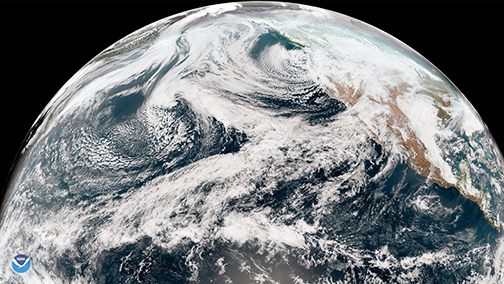 GOES-17 watches a storm nearing California on February 2, 2019. Image is courtesy of NOAA. Forecasters in Hawaii and other remote territories like the Marshall Islands and American Samoa are also now able to track thunderstorms in real-time. The Geostationary Lightning Mapper (GLM) on-board GOES-17 helps forecasters determine when thunderstorms and convective weather events are intensifying or becoming more dangerous. In 2018, the National Weather Service began using GLM data to issue severe thunderstorm warnings and keep the public out of harm’s way. Among the benefits of GOES-17’s high-resolution and rapid-scan capability is the satellite's ability to detect wildfires and monitor smoke coverage in near real-time. The dry climate of the western U.S. makes the region especially vulnerable to wildfires. In 2018, for example, California faced one of its deadliest and most destructive wildfire seasons on record. Providing high-definition images as often as every minute, GOES-17 helps forecasters distribute critical information to firefighters and emergency managers that saves lives. Real-time imagery of smoke plumes from fires also improves air quality forecasts. 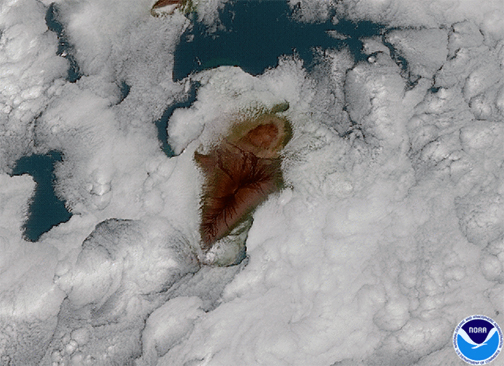 A screenshot capture of a GOES-17 loop from November 21, 2018, of sulfur dioxide concentrations that allowed forecasters to track volcanic ash from the eruption of Alaska’s Veniaminof Volcano. The ash clearly stands out even when other clouds are nearby. Image is courtesy of NOAA. GOES-17 has been especially valuable to Alaska, where NOAA’s older geostationary satellites provided far less coverage. The state’s vast territory and sparse population mean that Earth-based observations from radar, aircraft and buoys, are limited. 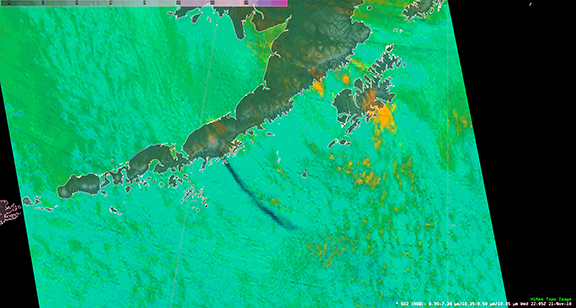 The satellite’s combinable image channels (known as “multi-spectral imagery”) help forecasters distinguish between clouds, snow-covered ground and sea ice around Alaska’s coasts. These advanced imaging capabilities mean safer, more accurate aviation and shipping forecasts, especially during Alaska’s long, dark winter months, when visible satellite imagery is less useful. Fog and icy conditions often cause flight delays and impact airport operations. At Ted Stevens International Airport in Anchorage, fog occurs almost daily during winter. The airport is the second-busiest cargo airport in the U.S. and fourth-busiest in the world, which makes understanding the timing of fog and low clouds especially important. Just as GOES-16 data helped airlines mitigate flight delays at San Francisco International Airport in early 2017, GOES-17 data will help forecasters to predict when fog will form and clear with much greater accuracy. Among GOES-17’s many benefits to Alaska is the satellite’s ability to track volcanic ash clouds. Data from GOES-17 makes it easier to determine the site of an eruption, as well as the height and direction in which an ash cloud is moving. Forecasters share this information with other agencies, such as the Alaska Aviation Weather Unit and the U.S. Geological Survey’s Alaska Volcano Observatory to issue volcanic ash advisories and other warnings to keep air travel safe. GOES-17 watches clouds form around Hawaii's Big Island on January 15, 2019. Image is courtesy of NOAA. Now that the satellite is operational, GOES-17 replaces GOES-15 as NOAA’s GOES West satellite. The latter entered service in December of 2011. However, due to technical issues with GOES-17’s Advanced Baseline Imager — or ABI, the satellite’s main instrument — GOES-15 and GOES-17 will operate in unison until early July 2019. The overlap will allow scientists and engineers to make sure that GOES-17 is performing adequately before the older GOES-15 satellite gets placed in storage as a backup. According to Dr. Stephen Volz, the Director, NOAA's Satellite and Information Service, the GOES-17 ABI is now projected to deliver more than 97 percent of the data it was designed to provide, a testament to the dedication of the engineers and all of the GOES project team members. Michael Ottenweller, a National Weather Service forecaster at the Anchorage, Alaska field office, said that in his nearly six years forecasting here, he has never seen a product revolutionize the ability to forecast the way GOES-17 has — the advent of GOES over this domain makes forecasting tangibly easier and better. He described a recent experience forecasting fog over southwestern Alaska. Before GOES-17 data was available, forecasters would have to wait for data from polar-orbiting satellites passing over Alaska. Now, not only do is there reliable data, but that data can be looped. This changes everything. The GOES constellation will continue to meet the needs of forecasters across the country.